BKT's FMX membrane platform is ideal for managing Flue Gas Desulphurization wastewater. With the arrival of the US EPA's effluent limitation guidelines (ELG), simple physical pretreatment or biological removal of selenium and nitrate alone will no longer be sufficient to render FDG wastewaters safe for discharge. Controlled compounds now also include arsenic and mercury, with other metals and salts poised to appear on permits in the future. Using nanofiltration membranes, the FMX system can be used as a universal pretreatment to remove all contaminant ions (total dissolved solids) simultaneously, giving utilities the power to meet ELG standards both now and in the future, or to opt for zero liquid discharge. 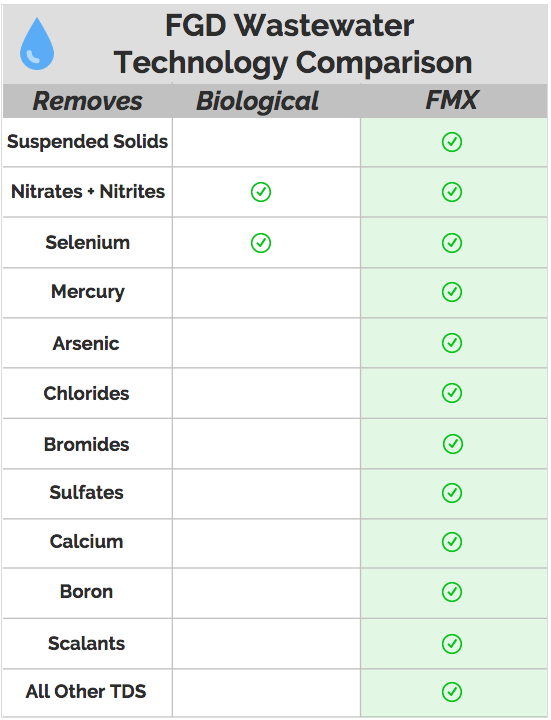 With its unique anti-scaling, anti-fouling technology, FMX can be installed alone or work in tandem with RO systems and evaporator technologies. FMX can significantly reduce CAPEX & OPEX costs for a range of FGD wastewater treatment processes, including reuse, discharge or evaporation. Thinking about membrane treatment for FGD wastewater? Think FMX! Flue gas desulphurization wastewater (FGDW) is a byproduct of pollution control processes at coal-fired power plants. This wastewater must be treated to meet selenium (Se), Arsenic (As), Mercury (Hg) and nitrate/nitrite (NOx) limits prior to discharge. In 2017, BKT piloted a new anti-fouling membrane treatment technology for FGDW at a 2,240 MW power plant. Trade-named FMX, the system uses rotating blades to create hydraulic vortices at the membrane surface, preventing the fouling and scaling experienced by conventional membranes. The pilot treated 5,000 gal/d using a membrane surface area of 54.5ft2 to compare FMX removal performance to an existing membrane bioreactor (MBR). Over 3 months of treatment, Se influent concentrations ranged from 71-697ug/l (mean 200ug/l). FMX achieved 61% average Se removal with min 47% and max 85% removal. Average removal for other target pollutants were 74%, 94%, and 35% for As, Hg, and NOx, respectively. Influent concentrations were 10mg/L for As, 51ng/L for Hg, and 24mg/L for NOx. FMX achieved an average flux of 61 gal/(ft2∙day) with negligible scaling/fouling observed. FMX effluent was able to meet the US EPA’s BAT and BADCT treatment standards for FGD discharge (2015 rule 40 CFR Part 423) but was not able to guarantee adherence to Se and NOx limits without downstream membrane processes. BKT is now testing a smaller pore membrane with a MWCO of 200Da intended to guarantee single-stage adherence to revised EPA standards.